Springvale Equipment Ltd has represented the French manufacturer Pack’R for more than 20 years. 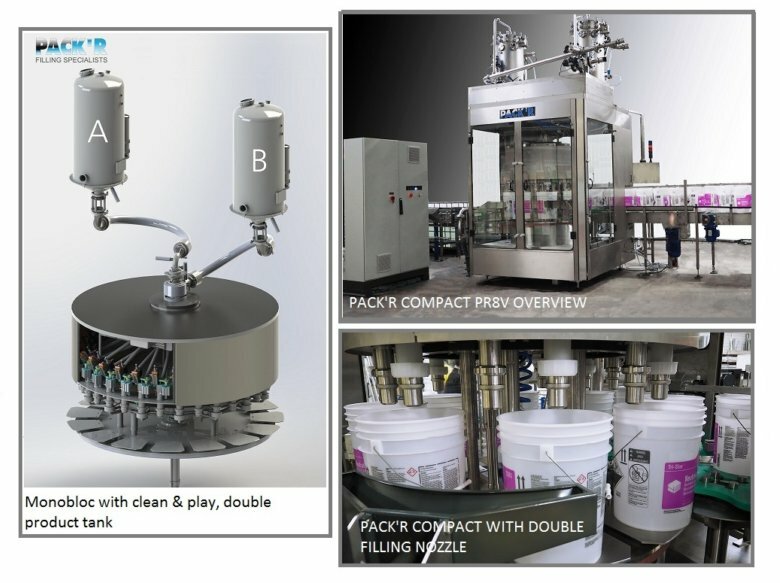 Pack’R are a specialist manufacturer of Weights & Measures approved weigh filling equipment for liquid and viscous products filling into containers/pails from 0.5lit up to 30 lit, offering automatic solutions for screw caps, push-in plugs and pail lids. On their high speed range of monobloc filler/cappers the customer request was to have a double tank/nozzle assembly but in this case they fill one product from one product tank and nozzle set whilst the 2nd tank and nozzle set is in CIP mode, as shown in the last photo (12 x filling stations with 24 filling heads and 4 x screw capping heads). This particular size machine will fill 120cpm on 1 litre and 60cpm on 5 litres. These solutions can be offered for more challenging products such as bleach where the machine requires special corrosion protection and contact parts. ATEX protection is another key area for Pack’R with many references in the market filling flammable products.